Kristen M. Watson and Mary Admasian's collaborative installation "The SHE Project: Part I" feels barely contained by its site — the small gallery in the University of Vermont's Living/Learning Center. The exhibit is packed with many hundreds of carefully grouped and arranged cosmetics bottles and containers, beauty aids of all kinds, hair-dye cans and even locks of cut hair, both colored and natural. These seem to multiply in the installation's many mirrors, included in nearly every arrangement. Indeed, exhibit viewers also become viewers of themselves, so rarely can they escape a glimpse of their own faces. That aspect has particular relevance for women visiting the exhibit, for "SHE" addresses the overwhelming pressure on females to look pretty. According to the artists' statements, that pressure — not a new one — has reached titanic proportions in the era of social media, which traffic in selfies and other images. Several works stage realistic scenes in which self-beautification might happen. "Am I Pretty Enough Yet?" consists of a dressing table crowded with cosmetics, its mirror bristling with bottles of nail polish. Most tableaux such as this one are Watson's. Admasian's less literal works address women's self-image and fulfillment using an entirely different palette of materials. The trio of "Third Eye Blind," "Love Thy Self" and "Blessed" consists of oval-framed mirrors bound with barbed wire and screened in sheer white silk, which is punctured in places by the barbs. The staged scenes will look both familiar and surreal to many women. 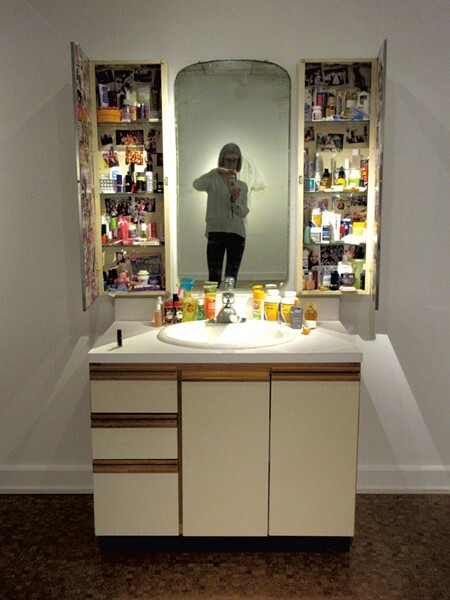 "Life in the Cabinet" is a circa-1990s vanity with two open medicine cabinets. Each is collaged with social-media photos showing how cosmetically achieved beauty is marketed to women throughout their lives, starting as early as age 5. From that age, represented by the lower left-hand cabinet, we move clockwise through the milestones of college, marriage and motherhood to grandmotherhood on the lower right. Shelves of age-appropriate hair, skin and nail products accompany each stage. While the artists insist the show leaves judgment to the viewer, these works strike a sinister note, which becomes explicit in the back wall installation. 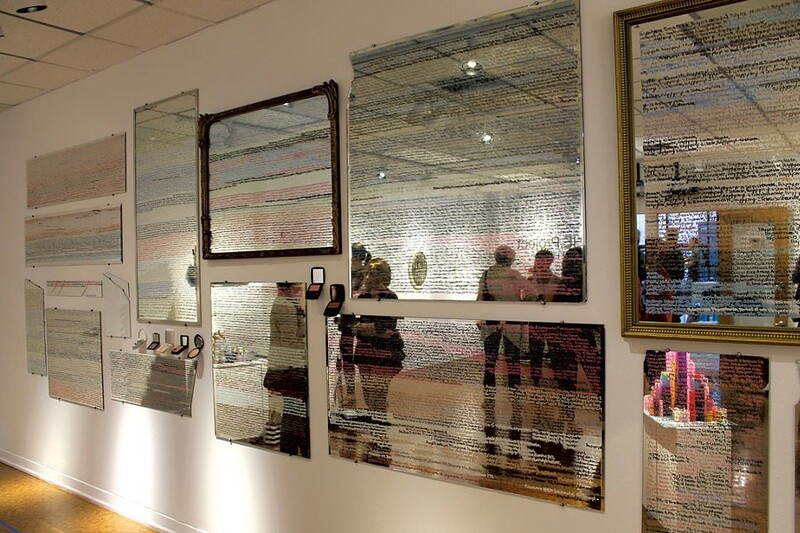 The wall is lined with mirrors densely covered with handwriting in colorful lipstick. Closer inspection reveals this to be a running list of chemicals used in the unregulated cosmetics industry. Only items beginning with A through P fit on the mirrors; the rest may appear in a future "Part II." The words are difficult to read on the reflective surfaces, and the observer's eye eventually goes to his or her own face. If female, it is most likely coated in such chemicals. Admasian's powerful "Lost Innocence" captures the show's only image of unaugmented beauty: an exotic Charaxes butterfly caught between layers of netting in a barbed-wire frame. This relatively small work is grouped with two wall-hung works made of mirrors and beauty products bundled with ornamental grasses, titled "100% Natural I" and "II"; and a yoga mat topped with wooden prayer beads. The ensemble raises the specter of the possibility that nature packaged for consumption could replace actual nature, preserved after death in "Lost Innocence." The new spiritual fulfillment, it implies, must be purchased. Watson's inspiration for the show was social media. According to her introductory remarks, she has noticed that she is now viewing, and therefore scrutinizing, images of herself more than ever before. The multimedia artist, well versed in the art of email blasts, Facebook posts and Twitter, invited the older Admasian, a marketing consultant and equally adept social-media user, to join her in creating the show. Yet "Part I" references social media directly only in "Life in the Cabinet." (Another connection: The show's materials, all donated, were gathered through Facebook, Front Porch Forum and other media.) Otherwise, the show has a quality of timelessness. Its familiarity raises the question: When have women not applied makeup while sitting at a dressing table? Indeed, the historical reach of such pressures is signaled in Watson's "Objects of Industry (Pin Up)," an assemblage of colorful plastic hair curlers stacked like a group of industrial smokestacks. Made of outdated beauty aids, the structure speaks to the toxicity women have long endured to conform to standards of beauty. Meanwhile, the circular cutouts of pinups painted by the midcentury advertising artist Gil Elvgren, visible at the base of each stack, illustrate the promised payoff. "SHE" raises the question of the role of feminism in the installation's conception. The artists' approaches are nearly polar opposites in this regard. By calling the works "femmages," Admasian reaches back to the height of the Second Wave: Artists Miriam Schapiro and Melissa Meyer coined the term in the 1970s to describe the uncredited origins of collage, among other artistic endeavors, in women's historical tendency to collect and piece together odds and ends. Watson's statement, meanwhile, wonders at the persistence of beauty expectations in "the postfeminist era." Perhaps the only "post-" this exhibit comfortably embraces is the gleefully postmodern appropriation of a hegemonic industry's products. Admasian's and Watson's works are available for up to $1,100 each. The original print version of this article was headlined "Sitting Pretty"